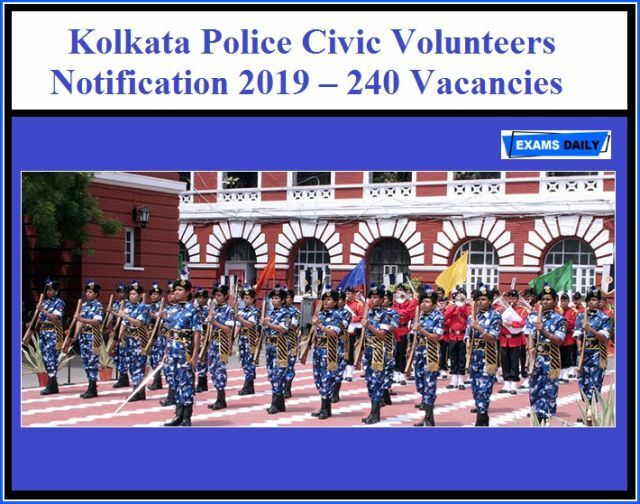 Kolkata Police invites application for the Recruitment of 240 Civic Volunteers for Men & Women candidates. Interested and eligible candidate may follow the details given below. Should be physically and mentally fit. Candidates (Men/Women) applying for Kolkata Mounted Police need to be willing to work with animals and have experience in this regard. Age limit (As on 01.01.2019): 20 to 60 years. How to Apply: Candidates may download an application from Kolkata Police website http://www.kolkatapolice.gov.in/ and send duly filled application form along with required documents to the respective Deputy Commissioner of Police address (Given in notification) latest by 4 February 2019.